Dr. Viki is a Stott Certified instructor in Pilates. We use the Stott Pilates philosophy and equipment for both rehabilitative exercise as well as in private and class exercise sessions. 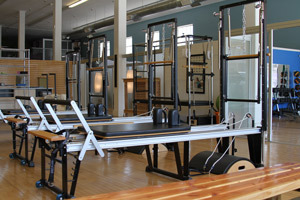 Stott Pilates is the refined method of the late Joseph Pilates which resulted in making this one of the safest and most effective methods of exercise science and rehabilitation. It incorporates modern exercise principles, and applies proven and accepted practices in biomechanics, rehabilitation and athletic performance enhancement. The Pilates program is designed to restore the natural curves of the spine while strengthening core stabilizer muscles. Making sure the body is in the correct position while exercising is an important part of Pilates so we will be placing an emphasis on pelvic placement and scapular stabilization. Modifications and preparatory exercises can be done to any of the techniques so it can be appropriate for many different body types and skill level. Join our Stott trained and certified instructors for a one-hour session. Dr. Viki White and Dr. Breckenridge use Stott Pilates for rehabilitation purposes so some insurance might cover some of the charges. Ready to get started? Contact our Enid wellness center today.